In an earlier post I touched on the colours and qualities of mid-century Kodachrome film, and the research value of old slides. 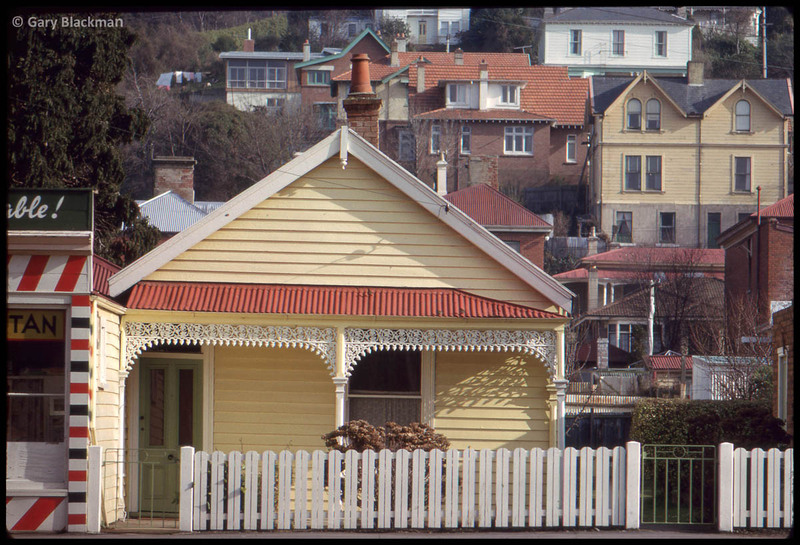 I am always eager to find more images of Dunedin in Kodachrome, and over the past few years have spent a lot of time working through slides of the late Hardwicke Knight. More recently, well-known photographer Gary Blackman has introduced me to his own wonderful collection. Any student of Dunedin architecture should be familiar with Ted McCoy and Gary Blackman’s Victorian City of New Zealand (1968). It was the first book dedicated to the subject of Dunedin’s historic buildings, and opened the eyes of many to the beauty and value of the city’s built heritage. A number of the buildings featured have since been destroyed. During the period Gary was taking some of the black and white images shown in the book, and even much earlier, he was also shooting in colour. The slides were primarily intended as documentary records, but naturally the photographer’s skill in composition, framing, and other technical and artistic elements, is ever apparent. The passage of time has added further dimensions. Some images are evocative through their sense of oldness – of the kind sometimes mimicked through Instagram filters. Conversely, a sense of freshness is often even more striking. There can be something unsettling about an image that looks as though it might have been taken yesterday, but shows a scene that has undergone radical transformation. Scenes that have only undergone partial transformation can be the most disconcerting, as familiar points of reference hammer home that this really is the same place. In other cases, it is amazing how little a place has changed in fifty or sixty years. The first looks east towards the Otago Museum. The building in the foreground was a Congregational church before it was purchased by the Catholic Church in 1932. It was demolished around 1971 to make way for the present Holy Name Church. Buildings and blossom are together the subjects. The gold of the museum’s masonry harmonises with the church’s timbers – a colour once ubiquitous for Dunedin buildings but relatively uncommon today. Motor cars (then older models) give a sense of period. The second image looks south along Great King Street, and makes a study of telegraph poles and wires. Gary tells me that at first he avoided such infrastructure, before increasingly incorporating and sometimes even featuring it. This particular image was used in a talk in which he illustrated the ‘visual clutter imposed on our streets by poles and wirescape’. The photograph was taken from a position approximately outside where Galaxy Books is today (just north of Moat Street), and the Wellingtonia in the distance, then already over a century old, is a familiar point of reference. In 1963 the one-way system was still five years away. 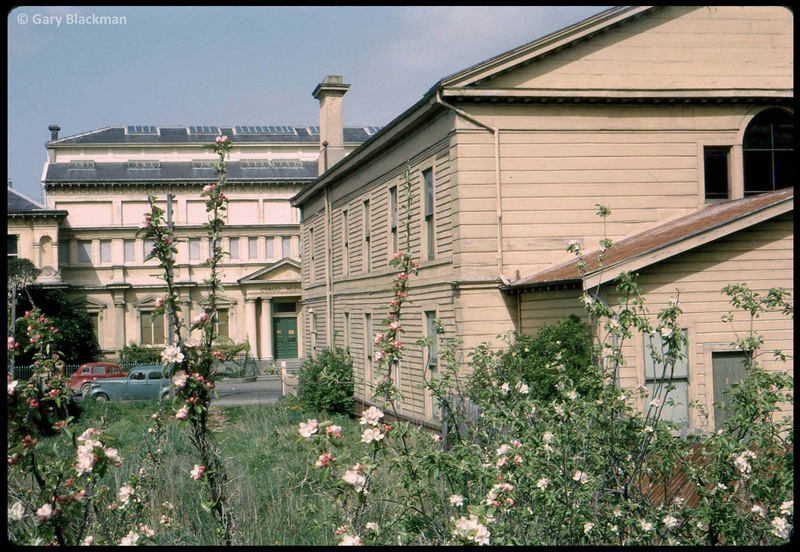 The final slide, taken in the mid-morning sun, shows a modest dwelling opposite the North Ground. It stood south of the Dundas Street corner, near where Coupland’s Bakeries is now situated. Unfortunately this charming little home with its pretty lacework was demolished long ago. It is contextualised in this image by the houses on the hillside, while the glimpse of the attached barber’s shop provides a delightful contrast. 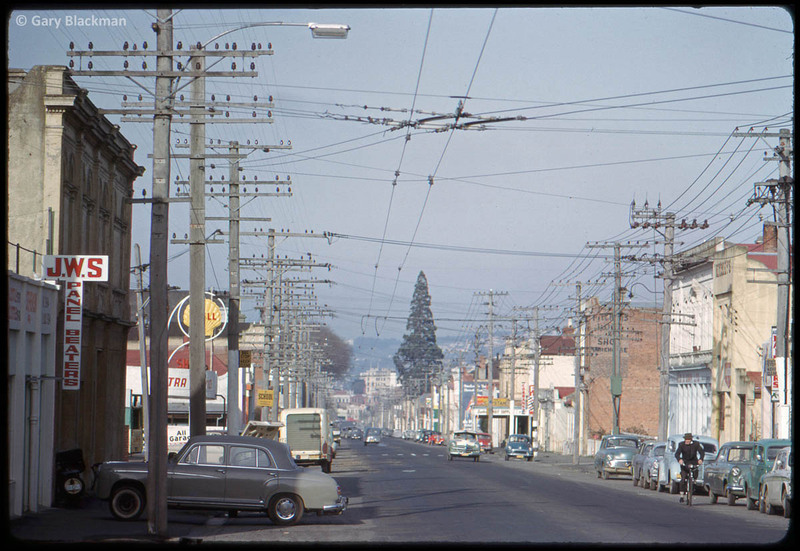 This entry was posted in Uncategorized and tagged Colour photography, Gary Blackman, Great King Street, Kodachrome, Otago Museum on 30 May 2016 by David Murray. A very interesting article and a pleasure to read. Very enjoyable so thanks for posting these photos – and the earlier ones referenced. Thanks Paul – your kind comment is much appreciated. I’m so pleased that you have posted this photo of what was my father’s family home at 636 Great King Street. I have been looking for a photograph of the place for some time and all I had been able to find up until now was a grainy black and white photo of the barber shop taken in the mid-70s (?) when it had become the headquarters of the Values Party. My grandfather William Thomas Knowles bought 636 Great King St around 1910-12 after he had shifted to Dunedin from Moa Flat. He and his wife Sarah Jane Knowles (born McFadgen) raised here a family of one girl (Ellen or ‘Nelly’ Knowles) and two boys, Tom Knowles (my dad) and Gordon Knowles. Nelly and Gordon, together with their Aunt Stella McFadgen, were hairdressers in the family barber/hair salon attached to the front of the home in Great King Street. In the yard behind the house was a small building (we called it a hall) that housed the Kia Ora Table Tennis Club, and I have lots of memories of playing ping-pong there with family and friends. Another resident at 636 was a sulphur-crested cockatoo named Sam who perched in a cage on the lounge for as long as I can remember. My dad Tom bought Sam off a ship at Port Chalmers when he was a teenager in the late 1920s, and Sam was still living in the lounge until the early 1970s when Nellie sold the house and moved to a lovely villa in Cumberland St, just north of the North Ground. Thanks for your very interesting comment Daniel – your history of the property adds a lot to the image. These places are always so much more interesting when you know who lived in them and the sort of lives they led there.